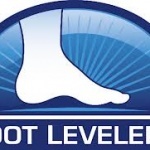 August 27, 2014 — Foot Levelers, along with Activator Methods, Multi Radiance Medical, and Lloyd Table Company, gave away $24,000 worth of chiropractic equipment at the Florida Chiropractic Association (FCA) National Convention and Expo this past weekend in Orlando. The four leaders in the chiropractic profession each gave away two of their pieces of equipment to five different budding chiropractic professionals, with the goal of helping get their careers off to a good start. The “big” winner was Hannah Hancock (pictured left with Foot Levelers Vice President of Education Mark Zeigler, DC), a current chiropractic student at Palmer College of Chiropractic Florida. Hancock won the drawing for a complete Graduate Package, which features a Foot Levelers 3D BodyView imaging system, an Activator V from Activator Methods, a MR4 Super Pulsed Laser by Multi Radiance, and a Lloyd Table 400AH Adjusting Bench. The retail value of the complete package is over $12,000. At a student/recent graduate luncheon held on Saturday at the FCA National Convention, four other chiropractic students each won pieces of equipment from the companies. Rachel Settles, a March 2014 graduate of Palmer Florida, won the drawing for an Activator V, while current Palmer Florida student William Morrissey won a Foot Levelers 3D BodyView imaging system. The Lloyd Table Adjusting Bench went to Palmer Florida student Mary Elder, while the Multi Radiance MR4 Laser went to current Palmer Florida student Karlton Kwan. Like the complete Graduate Pack, the value of all four pieces of equipment is $12,000. Pictured, from left to right: Max Kanarsky, Karlton Kwan, Michael Hunter, Mary Elder, Hannah Hancock, William Morrissey, Kent S. Greenawalt, Rachel Settles, Josh Daniels.